Today marked Day 3 of the #ISSRDC conference in San Francisco, California, featuring impactful and inspiring keynote speakers, technical sessions, and panel discussions that illuminated the excitement, opportunity, and innovation of ISS National Lab activities. The morning keynote was delivered by IBM’s Vice President of Open Technology, Todd Moore, and Chief Scientist for Software Engineering, Grady Booch, who shared their innovative ideas for addressing the world’s biggest challenges and their thoughts on the future impact of novel engineering and robotics. A stimulating panel discussion about the investments fueling the growth of new space businesses both large and small provided insight into the funding mechanisms currently in place and nodded to new or potential future funding opportunities. Key representatives from Apollo Global Management, Bessemer Venture Partners, and Xfund conferred on the finer details of investing and funding research and development in space. Another panel titled “Silicon Valley in Space: Exploring New ISS Innovations,” featured members from some of the most recognizable corporations and venture capitalist companies, who shared their expertise and experience working with the space station to achieve their existing company objectives and conceive future efforts. 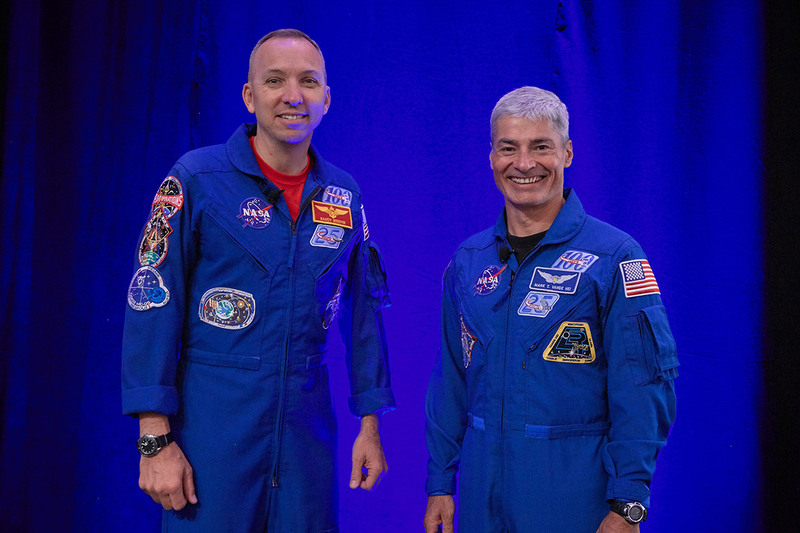 NASA Astronauts Randy Bresnik (left) and Mark Vande Hei (right) pose for a photo at ISSRDC 2018. 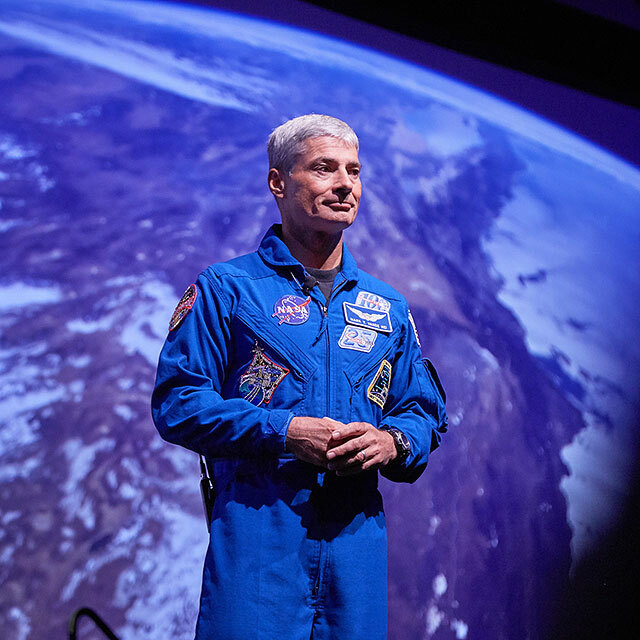 NASA Astronaut Mark Vande Hei, who spent 168 days as a flight engineer onboard the ISS, used his luncheon keynote to share some of the stunning imagery taken in low Earth orbit (LEO). His pictures and daily activities gave him a new perspective on collaboration and our place in the universe. Day 3’s technical sessions were a rich offering of cell biology and bioscience platforms, space-based student projects, technology development and new commercial platforms, and health countermeasures and assistive devices for living and working in space. A round table discussion, “Space for Earth: Developing a Sustainable Demand for Low-Earth Orbit Services,” brought to life the details of the current business landscape for developing new industries to grow a sustainable LEO economy. Government agencies also shared their unique perspectives on ISS Transition and LEO commercialization, highlighting utilization activities designed to build sustainable demand for LEO services. The day’s activities closed with a productive networking reception in the Marketplace Expo, with poster presentations on display throughout the hall. Get ready for tomorrow, STEM Day at #ISSRDC! The final day of the conference shines a light on the exciting student research and the ISS Space Station Explorers consortium, and we will welcome Executive Producer and Host of FOX’s “Xploration Outer Space,” Emily Calandrelli, and NASA Astronaut Randy Bresnik. Access the app for additional information on tomorrow’s agenda and take advantage of the scheduling and networking apps to enhance your conference experience!